Ukraine's Prosecutor General Yuriy Lutsenko has said there is a need to establish the unavoidability of punishment for violence against members of law-enforcement bodies in light of the declaration of a state of martial law in several regions of Ukraine. "I've had a talk with Interior Minister Arsen Avakov. 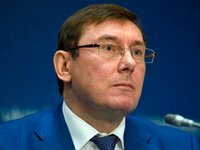 I think now is the time, when the state of martial law has been declared, to make a decision that any physical assault on members of law-enforcement bodies must receive a response provided for by the law—a shot upwards and then an aimed shot," Lutsenko told a press conference in Odesa on December 4. "Monopoly on violence in the state must only belong to the state alone. No other person who doesn't wear a uniform, hasn't sworn the oath and is not subject to criminal liability for violating the rules of violence application provided for by the Ukrainian state, can do it without being punished, either against citizens, or law-enforcement personnel. It seems to me the time is ripe to establish the dictatorship of law in this regard," the prosecutor general said. Lutsenko said martial law "may become the factor that restores respect to this principle."